LGBT activism is often imagined as a self-contained struggle, inspired by but set apart from other social movements. 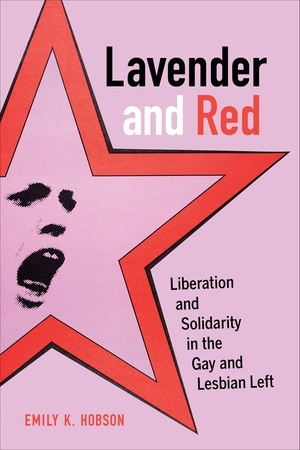 Lavender and Red recounts a far different story: a history of queer radicals who understood their sexual liberation as intertwined with solidarity against imperialism, war, and racism. This politics was born in the late 1960s but survived well past Stonewall, propelling a gay and lesbian left that flourished through the end of the Cold War. The gay and lesbian left found its center in the San Francisco Bay Area, a place where sexual self-determination and revolutionary internationalism converged. Across the 1970s, its activists embraced socialist and women of color feminism and crafted queer opposition to militarism and the New Right. In the Reagan years, they challenged U.S. intervention in Central America, collaborated with their peers in Nicaragua, and mentored the first direct action against AIDS. Bringing together archival research, oral histories, and vibrant images, Emily K. Hobson rediscovers the radical queer past for a generation of activists today. Emily K. Hobson is Associate Professor of History and of Gender, Race, and Identity at the University of Nevada, Reno.